Many Florida homeowners know that they are eligible for as much as a 58% discount on their homeowners insurance by having hurricane protection. However, most people don’t realize that every opening of the home (even that pesky small bathroom window on the side of your house) must be protected in order to be eligible for the discount. The reason for this is simple: if any portion of the homes “envelope” is compromised, wind and rain will enter the home, and the pressure may ultimately tear the roof off the home. The picture below illustrates how Hurricane Fabric solves traditional hurricane protection (metal shutters, impact glass, etc..) challenges. 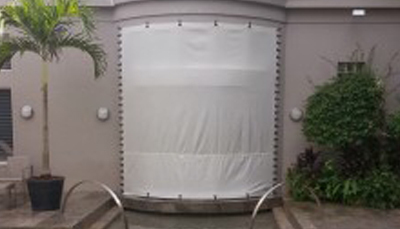 In this instance, the homeowner lost the Hurricane Protection Mitigation discount portion of his homeowners insurance policy because one opening was not protected (single picture window below). This window is a large “curved” window overlooking the Pool and Spa area. The window has multiple panes that are connected with a silicone seal, which provides a clear vista from inside the House. The homeowner did not want to replace the window with an impact window as that would require aluminum mullions between each pane and destroy the open view (not to mention the increased cost- roughly 5x’s the cost of our fabric). Moreover, Steel Panels and Accordions Shutters were ruled out due to the unattractive, permanently affixed Tracks and Accordion Stacks on the exterior. HurricaneFabric.com provides a direct mount, easy to install hurricane shutter with chameleon-esque stainless steel attachments that are paint-able and flush with the homes exterior (no ugly wing nuts to look at all year round); In fact, most customers report that visitors can’t even tell they have hurricane protection. The Homeowner got back his mitigation discounts and retained the aesthetics of his pool area. One more reason to use Hurricane Fabric.